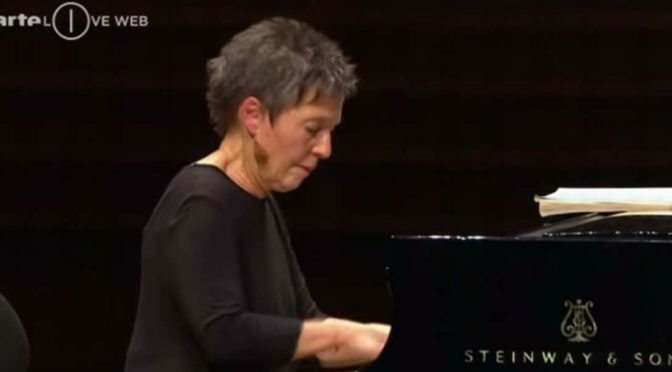 Maria João Pires, one of the finest pianists of her generation, performs Ludwig van Beethoven’s Piano Sonata No. 17 in D minor, Op. 31, No. 2, usually referred to as “The Tempest” (or Der Sturm in native German). Recorded on November 21, 2013 at Salle Pleyel (Paris). The piece was composed in 1801-1802 and was nicknamed the “Tempest sonata”, not a name by Beethoven himself but by Anton Schindler, or rather because of Anton Schindler. Schindler was Beethoven’s secretary and after the composer’s death, he told tons of stories, many of them not true (much of Schindler’s information is distrusted by classical music scholars). According to Schindler, when he asked Beethoven about this sonata, the answer was that if he read Shakespeare’s “The Tempest” he would understand the music. The piece consists of three movements. Each of the movements is in sonata form, though the second lacks a substantial development section. Largo – Allegro The first movement alternates brief moments of seeming peacefulness with extensive passages of turmoil, after some time expanding into a haunting “storm” in which the peacefulness is lost. This musical form is unusual among Beethoven sonatas to that date. Concerning the time period and style, it was thought of as an odd thing to write; a pianist’s skills were demonstrated in many ways, and showing changes in tone, technique and speed efficiently many times in one movement was one of them. The development begins with rolled, long chords, quickly ending to the tremolo theme of the exposition. There is a long recitative section at the beginning of this movement’s recapitulation, again ending with fast and suspenseful passages. Adagio The second movement in B-flat major is slower and more dignified. It mirrors the opening of the first movement both through use of a rolling recitative-like arpeggio on the first chord, and the rising melodic ideas in the opening six measures, which are reminiscent of the first movement’s recitative. Other ideas in this movement mirror the first, for instance, a figure in the eighth measure and parallel passages of the second movement are similar to a figure in the sixth measure of the first. Allegretto The third movement is a sonata-rondo hybrid in the key of D minor. It is at first flowing with emotion and then reaching a climax, before moving into an extended development section which mainly focuses on the opening figure of the movement, reaching a climax at measures 169–173. The recapitulation, which is preceded by an extensive cadenza-like passage of sixteenth notes for the right hand, is followed by another transition and then another statement of the primary theme. The refrain undergoes phrase expansion to build tension for the climax of the movement at measure 381, a fortissimo falling chromatic scale.